Can you live in 90 Square Feet? Felicia Cohen shows us around her microstudio. This makes me think of my stuff. Do I have enough stuff to fit into this space? Or is this space too small for me? First off, I don’t think I can EVER live in this space, not because I have too much stuff, but because I’d have to give up my dream of owning a library. I want a library. I want a place where I can have my books and have my solitude. I can’t imagine not having books around me. Even though I have a kindle which has close to 200 books on it, I still can’t imagine living without physical books. If my books weren’t allowed, I think I could fit, but I would never do this. Why pay about $700 for such a small place when it’s not necessary? As I walked to the train station, I noticed buds on the trees. “These are the signs of spring,” I thought and it thrilled me a bit. A little further on I saw this tree beginning to blossom. It reminded me of cherry blossoms, something I’ve only seen in pictures. This year, I’ll try to go to a cherry blossom festival, or at least to see the blossoms. 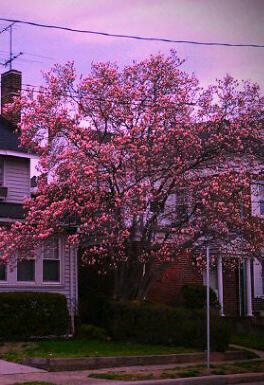 There’s something about a blossoming tree that makes me feel light inside. It’s a little reminder that after the stark nakedness of winter, comes life.